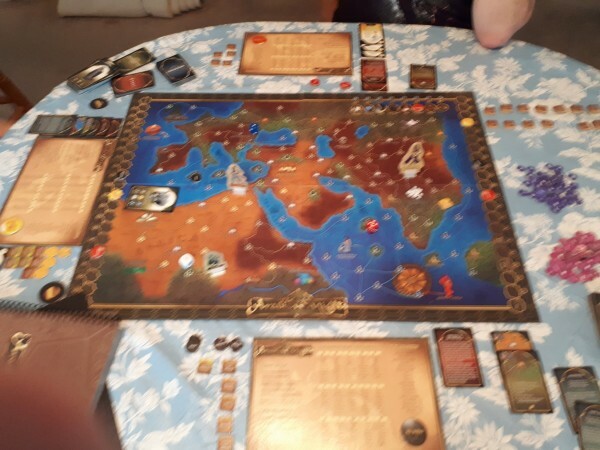 Posted by jkahane in board games, gaming hut, personal, playing, rpg hut, tales of the arabian nights, torg eternity rpg. The Sunday gamers have left for the day, actually having departed around 4:30 pm, though stuck around for a bit afterwards as I showed him what Torg: Eternity‘s basic game mechanics are like (more on that in a bit). Once the players arrived around 12:45 pm, we chatted for a bit, and then I gave the players the options that I had in mind for today’s gaming (see the previous post): 1) Continue the campaign of the Coriolis – The Third Horizon RPG; 2) Start of the renewed <SkyRealms of Jorune RPG with some character generation; 3) Play a board game of some sort; and 4) Play the Torg: Eternity Free RPG Day little adventure thingie. They vetoed 1) because they felt that…well, never mind what they felt about the game after the hiatus they’ve had. They vetoed 2) for the moment because they were concerned with my voice. They vetoed 4) because Tammy felt that Torg without the Drama Deck just wasn’t Torg, so she’d wait for the game in October or so (assuming everything works out with the Kickstarter. So in the end, it was decided to play a board game. The two players settled on Tales of the Arabian Nights, so that is what we played. To be honest, I wasn’t feeling it for most of the afternoon and while I guess the game went all right (well, at least for Tammy it did, as well as for SteveR), I was somewhat…bored…with it. Absolutely nothing was happening for me, playing Ali Baba, other than getting Scorned and then being Enslaved towards the end of the game. Here’s a photo, not a great one, that I took of the game board and the surrounding area at one point late in the game. We wrapped up the game around 4:30 pm, and it was clear that SteveR was the winner, based on the fact that he’d completed 2 Quests to Tammy’s 1 (and I hadn’t even finished my first one). After SteveR helped me pack up the game, I grabbed the Torg: Eternity Free RPG Day material, and for 15 minutes he went through a couple of encounters for the game using the Celebrity player character. He rather enjoyed it, and I think he regretted not playing the Torg: Eternity game this afternoon. Once SteveR took off, I collapsed on the couch and had a cup of hot tea and half a bagel with vegetables for snack.